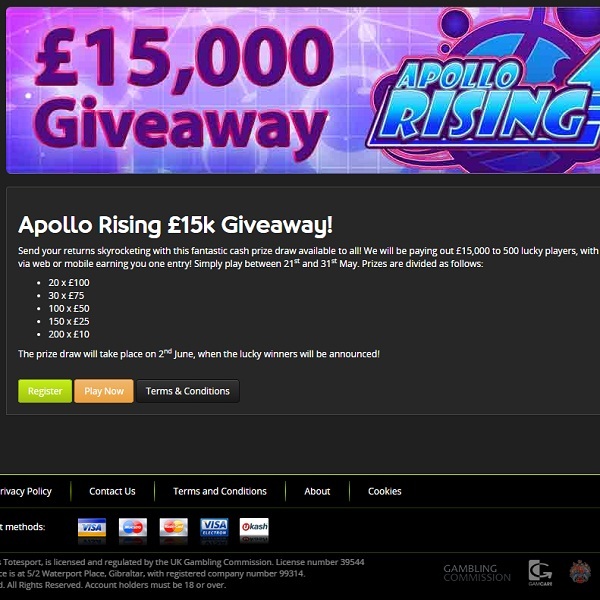 Totesport Casino has just launched a brand new slot game, Apollo Rising, and to celebrate the casino is giving away £15,000. All players have to do is play the new slot and for each £10 they bet they will receive one entry to the prize draw. Players will collect one ticket each time they bet £10 so the more that you play the better the chances of winning. The prize draw is taking place on Sunday, May 31st, and the prize fund will be divided between 500 lucky players. Two hundred players will receive prizes of £10, 150 players will receive prizes of £25, 100 players will receive prizes of £50, 30 players will receive prizes of £75 and 20 players will receive prizes of £100. Why not give this fantastic new slot a go and see if you can become one of Totesport Casino’s lucky players.